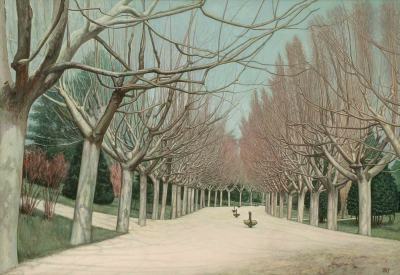 On first sight, this work might appear to be an idealised image of a tree-lined avenue. The title will perhaps help us to see it as something else as well: a symbol of that splendid order which nature, perfected by the hand of man, should possess in accordance with the Creator's plans... as the Garden of Eden originally did. Not a single person is pictured here; the presence of humanity, however, is implicit, as nature ordered by the mind and hand of man is the entire theme of this work. The Creator has left His creation unfinished, precisely so that it would be man who perfects and concludes it; man is thus a participant in the creative power of his Maker: “And the Lord God took the man, and put him into the garden of Eden to dress it and to keep it.” (Genesis 2:15). This possible collaboration —conscious and free— berween man and Creator is more easily observable in a rural context (man sows, tills and harvests the land; God provides sunshine, rain, seed.. causes the seed to germinate and the crops to grow...).